Slice or tear radicchio and romaine lettuce into bite-sized pieces. Soak radicchio in cold water 10 to 15 minutes; drain and pat dry. 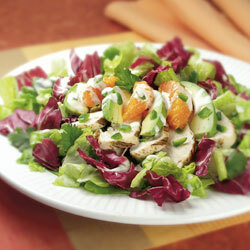 In large bowl, combine lettuce and remaining salad ingredients. In small bowl, whisk dressing ingredients until smooth. Pour over salad and toss.